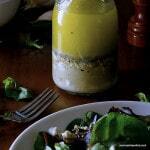 Need a dressing to wow guests or a great dressing for a steak salad? This Crumbled Blue Cheese Vinaigrette won’t disappoint. It’s fast and easy to prepare. When I was in High School and College, my family would often celebrate special occasions at a favorite restaurant. In small city like Binghamton, NY, there weren’t many fancy restaurants, but one restaurant stood out more than any other – especially for family reunions. As I’ve mentioned before, my Great Grandparents immigrated from Italy and settled in Cadosia, NY. Itailian food was an important part of our food culture growing up. Cortese was the one place on which my Great Aunts and Uncles and cousins could all agree. An institution since the 1940’s, Cortese has long enjoyed their reputation for serving good Italian food – like Grandma used to make. When my family went to Cortese, I always ordered the Homemade Manicotti, Fresh Sea Scallops or Shrimp Scampi; which are still on the menu. We always started dinner off with a salad and for everyone except myself, the dressing of choice was the crumbled blue cheese vinaigrette. At the time, my taste buds had not matured enough to appreciate the sharp, salty, pungent flavor of blue cheese. I couldn’t understand the desire behind something that tasted, to me, like stinky feet. I didn’t eat Parmesan cheese either, for the same reason. I know, I was weird. I was feeling a little nostalgic the other day and decided I wanted something different for our evening meal. Don’t get me wrong, we really enjoy our Basil & Mint Vinaigrette and Garlic & Herb Vinaigrette dressing, but I wanted something special for the spectacular garlic rubbed steak I had grilled and planned to put on our salad. I was also feeling a little lazy and wanted something simple to prepare with ingredients I already had on hand. What’s more simple than an Italian oil and vinegar salad dressing? Adding the crumbled blue cheese to the dressing reminded me of the crumbled blue cheese vinaigrette my family used to order at Cortese. Perfect! 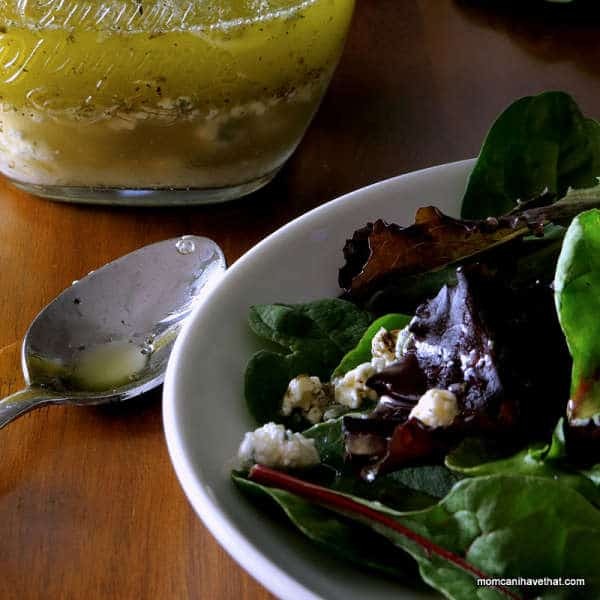 The flavor improves over night, so one may want to make the vinaigrette the day before, then add the crumbled blue cheese before dressing the salad. 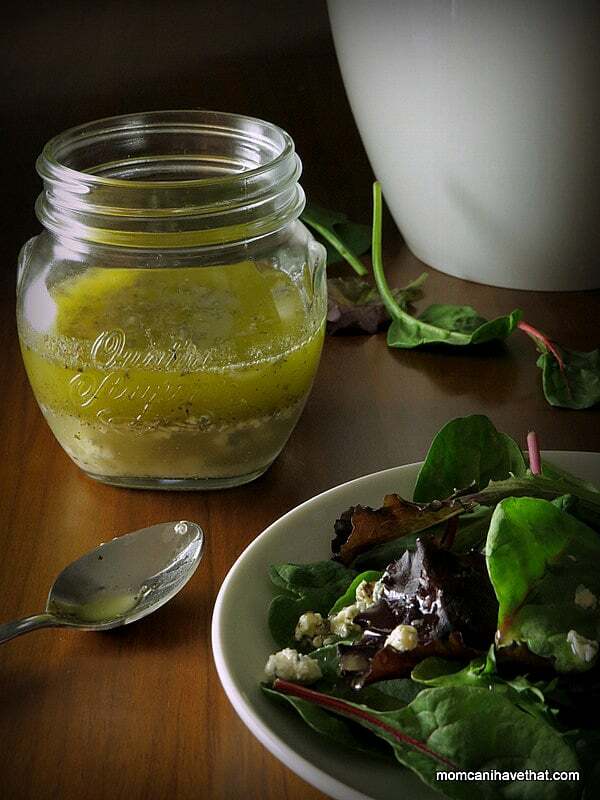 This awesome Crumbled Blue Cheese Vinaigrette is 1 net carb per serving! Powder the erythrtol so that it will dissolve more easily. Peel the garlic clove and smash it by placing it between the flat of the knife and cutting board and giving it a whack. Add the salt to the garlic and mince, then mash into a paste by dragging the blade over the garlic and mashing it into the cutting board. Scrape up the paste. In a bowl large enough to prevent splashing, add the vinegar, garlic, paste, water, salt, pepper, spices and sweetener. Whisk until the sweetener dissolves. Pour the ingredients into a jar with a tight fitting lid and add the oil. Shake vigorously for a few minutes to temporarily emulsify the ingredients. Add the crumbled blue cheese and agitate gently. Spoon over the salad and serve. HI Kim, I always look at recipes and never the stories behind them.. something made me read yours! Cortese first caught my attention, then the Cadosia Ny! I to had grandparents from Italy that settled in Cadosia! The Lombardi family. Who knows, maybe we are related ! Can’t wait to try your recipe !! How long could this keep? I’ve made this multiple times – it’s now my favorite salad dressing. Get. Out. Of. Town! I have been pinning your recipes like crazy this week, and come to find out you are right here in the Triple Cities! Thank you for all the great recipes – and I would be delighted to be your sous chef any time! Do you have a recipe for the regular balsamic italian dressing there? SOO delicious, ive never had one quite like it! Thank you, Sean! I’m glad you like it. I haven’t posted a balsamic dressing yet, but will get on it! In the meantime, I have several dressings listed under Basics. Have a nice week. Okay, this just looks YUMMY!!! Want to haz! !